Forest management is affected negatively by excessive environmental damage caused during harvesting operations. Several studies on the effects of harvesting in Indonesia indicate that felling and skidding, based on the Indonesian Selective Cutting and Planting System (TPTI), cause, on average, 20-45 percent damage to the residual stand and open up about 20-35 percent of the area depending on harvest intensity, topographic conditions and machinery (Bertault and Sist, 1997; Elias, 1998). Reduced impact logging (RIL) has been tested recently in Indonesia in several forest concessions. Research results indicate that RIL implemented in a practical manner can raise forest-harvesting performance (Klassen, 2000). The implementation of RIL fulfils several key indicators of the Indonesian standard for forest certification in natural production forests (Agung and Hinrichs, 2000). reduce rehabilitation and planting costs. Implementing RIL should also have a positive impact on efficiency and cost-effectiveness. Some private forest concessionaires in Indonesia, especially those considering or already preparing for forest certification (ecolabelling), perceive these benefits. However, most concessionaires remain reluctant to adopt RIL because they believe that it requires major changes to field operations and well-trained staff. Many questions regarding the economics of RIL also remain. Finally, neither the Indonesian Government nor civil society encourages or pressures the private sector to implement RIL. RIL should not lead to major additional investments (re-engineering of harvesting machinery and change in methods are not required). RIL should be tested/implemented under the current conditions of the concession (workforce, topography and existing machinery). RIL should neither reduce productivity nor increase operational costs. RIL should reduce logging waste. RIL should be in line with government regulations and certification requirements. These are typical needs of private companies. Avoiding re-engineering and major investments will only be possible for companies currently operating on flat or slightly undulating terrain. Logging operations in the mountainous regions of Borneo have to consider skylines or equivalent cable systems, especially if forest certification is the aim. The following discussion does not cover such conditions. In 1998, the management of P.T. Limbang Ganeca/East Kalimantan and the Sustainable Forest Management Project (SFMP-gtz) launched a RIL pilot project. In a first step, a RIL implementation team was established at camp level, comprising the camp manager and the heads of the logging and planning divisions (Kabid Perencanaan and Kabid Produksi). To implement RIL effectively, the planning and production teams need to cooperate closely. In-house training for the planning and production teams was conducted, focusing on necessary changes and additional tasks. The company developed computer software for topographic data analysis. In 1999, a comparative study was conducted in five 1-hectare plots of two compartments. 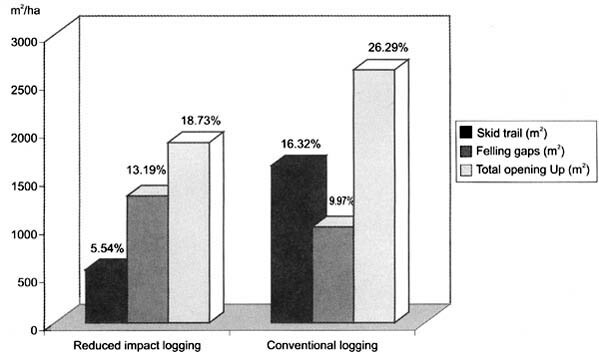 The effects of conventional logging (CL) versus RIL were evaluated, with regard to damage, efficiency, productivity and costs (Ruslim et al., 2000). At the same time, the cutting block for the next year was prepared by the planning division following RIL requirements. Several in-house training courses for logging crews (foremen, operators) and external courses for the division heads were conducted. By the end of 1999, RIL was understood completely at all levels in the company and RIL guidelines and standard operating procedures (SOP) were prepared (Ruslim et al., 1999, Ulbricht et al., 1999). Implementation started in 2000 on a 2 350 ha annual cutting block with ongoing monitoring/evaluation by the company, SFMP-gtz and a joint implementation team from the Ministry of Forestry the company and SFMP-gtz. The results are currently being analysed. RIL was defined as consisting of six major elements (Figure 1). Two years before felling (Et-2), in addition to the standard pre-harvest inventory, a detailed topographic survey is conducted. 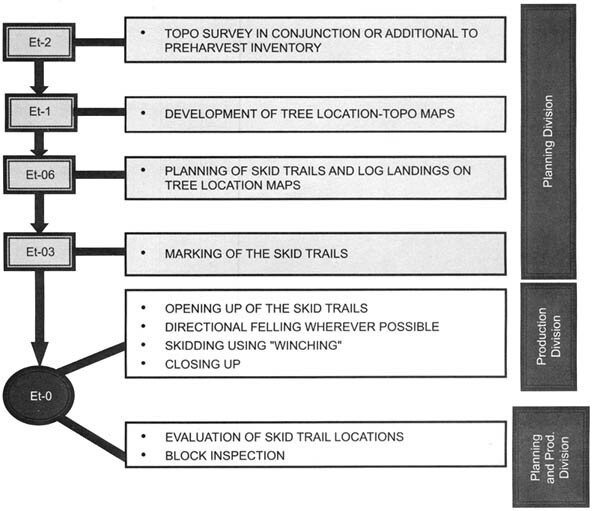 Six months before logging (Et-06), a tree location map is prepared (GIS-based), on which the optimal locations of the skid trails, according to ten agreed upon principles, are planned and marked. The marking of skid trails in the field and opening up take place prior to felling. The principles of the skid trail determination are explained in the SOP. The felling team is advised to conduct directional felling whenever possible and reduce logging waste to a minimum. Safety measures are required such as escape routes, flexibility in felling direction and personal safety equipment. Skidding is allowed only on the planned skid trails, resulting in a winching corridor of 30 m on both sides of the skid trail. Blading is avoided whenever possible (on all skid trails with slopes less than 20 percent). The foremen of the production section conduct supervisory and routine controls. After the completion of logging, tractor operators close skid trails to reduce erosion. Joint teams (production and planning) assess the quality of work in order to determine premium wages. Topographic survey in conjunction or additional to pre-harvest inventory (ITSP). Development of tree location maps with topographic information. Planning and marking of skid trails. Opening up of skid trails. Closing up of skid trails and log decks. 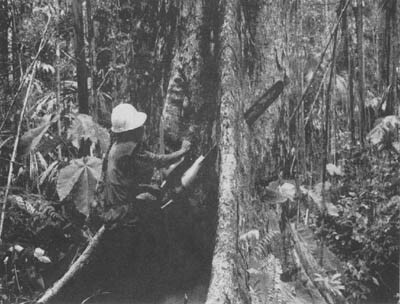 Supervisory and routine control during logging. Evaluation of planned and actual skid trail locations. Block inspection after logging (work performance evaluation). For the block inspection, task indicators - grading scheme and field evaluation sheets - were developed. Based on a sample of 30 trees and 2-3 skid trails per sub-compartment, the performance (work quality) of each operator team was evaluated. It is proposed to combine the block inspection results with the payment scheme (base wage plus additional quality premium) to secure workers interests. Table 1 provides an example of the internal evaluation of the activities by the chainsaw operator and assistant. NB: Points 1, 2, 6, 11, are tested when felling is carried out by the chainsaw operator and assistant. Professional judgement is needed by the evaluator. Table 2 shows the major differences between the proposed tractor-based RIL and CL in Indonesia. Forest concession area since 1969; sustainable AAC 52 500 m3/yr (result of DIPSIM calculation). Lowland dipterocarp forest, undulating terrain (slopes less than 30 percent); altitude 70-80 m asl. High logging intensity of 65 m3/ha (11-12 trees/ha) on all plots. Distance between plots and log yards identical for RIL and CL plots. Standard equipment: Komatsu D85E-SS crawler tractor, Stihl 070 chainsaw. Experienced operators on all plots; operators on RIL plots familiar with RIL. Winching up to 30 m on RIL plots; tractor operator has two helpers. A time study for felling and skidding was conducted and data on residual stand damage (>20 cm diameter at breast height [DBH]), timber output (net exploitation factor) and forest opening were collected (Figure 2). In the study area, the differences between RIL and CL for felling activities were minor. Concerning skidding, there was a noticeable difference in pure work time. Overall skidding productivity (per day) was calculated based on work time including lost time for meals, private activities and machinery repair. Skidding under RIL required more time and reduced productivity by about 15 percent compared to CL. The main reason is that winching was conducted up to 30 m and tractor log loads were not combined. Reducing the winching corridor to 15 m and allowing combined loads to be skidded would increase skidding productivity, but would also increase damage. Stand openings following RIL were 29 percent lower than after CL. In particular, opening up by tractors was reduced drastically (by 65 percent). The damage caused by tractors usually delays natural regeneration. The large reduction indicates considerable environmental benefits and demonstrates that forest concessions adopting RIL can pass forest certification more easily (Figure 3). The residual stand damage due to felling was not particularly different between the two treatments (dbh of trees measured was 20 cm up). However, damage to the residual stand caused by skidding in CL was far greater. RIL caused 26 percent less overall damage to the residual stand. In particular, RIL reduced residual stand damage from skidding by 55 percent as compared to CL (Figure 4). The net exploitation factor in the RIL plots was higher (85 percent) than that in the CL plots (81 percent). Logging waste was reduced by 20 percent, although the CL operators were also instructed to reduce waste. Efforts have been made to increase timber usage efficiently by cutting the buttresses and placing the undercut properly (Figure 5). Cost calculations are based on the assumption that in CL one felling and one skidding team (five workers) can complete 30 ha/month (timber production of 1 425 m3/month). Table 3 shows some cost data for harvesting operations. * Calculations for a joint ITSP and topographic survey team. ** RIL reduces skidding productivity by 15 percent, volume skidded is therefore reduced to 25.5 ha/mth. Operational variable machinery costs are estimated to be reduced by between 5 (Estimation 1) to 15 percent (Estimation 2). Under RIL the work time of a tractor working with a heavy load is reduced (more time was spent for non-travelling activities like winching and opening up areas; the number of trees per trip was also less). Therefore, the variable tractor costs (especially maintenance and fuel costs) could be reduced by 5 to 15 percent, although additional tractor costs accrue due to the use of higher quality cables in RIL. Implementing RIL under the forest conditions of P.T. Limbang Ganeca required additional tasks for planning and the production teams (e.g. for the topographic survey, marking and constructing skid trails prior to felling, winching and closing up of the skid trails). The additional tasks increased operational costs by approximately Rp 1 000/m3 for the planning operations and Rp 5 000 to 7 000/m3 for production operations (depending on the estimation for variable tractor costs under RIL). Harvesting costs (including planning and operational cost up to roadside/log landings) consequently were only about US$1.00/m3 higher (at an exchange rate of US$1.00 = Rp 6 000) (Table 4). Additional overheads for human resource development, block inspection, team coordination and planning technologies still need to be considered. However, increased operational costs were covered directly by the financial gains due to higher timber utilization (increased net exploitation factor of about 4 percent). If the company is allowed to raise the annual allowable cut according to the higher exploitation factor, implementing RIL under the conditions of this case study will lead to a direct financial benefit. Note: Harvesting intensity = 48 m3/ha; financial data represent cost calculations before the Asian crisis (1997). Other tangible benefits of RIL include a reduced need for forest rehabilitation (obvious in the study case), lower equipment maintenance, lower accident rates and shorter time needed for the forest to recover until the next economically viable harvesting (shorter cutting cycle). The direct and indirect economic benefits, as under the conditions of the study area, clearly support RIL implementation. A long-term commitment by senior management to change from a functioning and legally acceptable harvesting system to a more complex system that requires detailed instructions to field managers. Willingness to invest in human resources development (training, study tours) and, if required, in new technologies (database management, GIS). Freedom for the field staff to apply a learning-by-doing approach. Time to adjust planning and production measures (a minimum of two to three years). Intensive and reliable internal control systems. A culture of openness and regular communication and feedback. Role of the government: So far, RIL is neither enforced nor controlled precisely by the Indonesian Government. Innovative concessionaires receive no incentives to conduct environmentally sound harvesting. Role of the government: Legal framework conditions support RIL insufficiently. Currently almost all forest concessions in Indonesia are affected by tenure insecurity (land claims, illegal logging), major uncertainties about their legal status, ambiguous policies regarding license extension and major political changes (related to political/administrative decentralization). Only transparent and stable framework conditions can encourage investments in environmentally sound harvesting. Role of the forest concessions: Forest concessionaires have to accept RIL as a standard part of TPTI, which they are obliged to follow. Any long-term commitment in forestry requires RIL and related human resource development. Role of the international community: So far RIL implementation is more a set of secluded project activities than a strategic approach to improve forest harvesting. International organizations and donors need to streamline their activities and provide effective policy advice and training. Role of the market: Forest certification (ecolabelling) requires RIL. However, market incentives for certified timber products are still uncertain. Market initiatives should encourage forest concessionaires to invest in RIL, for example, with partnership agreements between timber consumers and producers. Agung, F. & Hinrichs, A. 2000. Self-scoping handbook for sustainable forest management certification in Indonesia. SFMP Document No 6a. Jakarta: Ministry of Forestry and Estate Crops in cooperation with Deutsche Gesellschaft für Technische Zusammenarbeit. (Indonesian version also available). Bertault, J. & Sist, P. 1997. An experimental comparison of different harvesting intensities with reduced impact and conventional logging in East Kalimantan, Indonesia. Forest Ecology and Management, 94: 209-218. Elias. 1998. Reduced impact harvesting in the tropical natural forest in Indonesia. Forest Harvesting Case Study 11. Food and Agriculture Organization of the United Nations, Rome. FAO. 1999. Code of Practice for Forest Harvesting in Asia-Pacific. RAP Publication: 1999/12. Food and Agriculture Organization of the United Nations, Bangkok. Klassen, A.W. 2000. Analisis aspek finansial dan produktivitas reduced impact logging (RIL). Hutan Indonesia. Buletin terbitan APHI. Edisi 09, Tahun II/Agustus 2000. Ruslim, Y., Hinrichs, A. & Sulistioadi, B. 2000. Study on implementation of reduced impact tractor logging. SFMP Documents No. 01a. Jakarta: Ministry of Forestry and Estate Crops in cooperation with Deutsche Gesellschaft für Technische Zusammenarbeit. (Indonesian version also available). Ruslim, Y., Hinrichs, A., Ulbricht, R. & P.T. Limbang Ganeca 1999. Technical guideline for reduced impact tractor logging. SFMP Documents No 10a. Jakarta: Ministry of Forestry and Estate Crops in cooperation with Deutsche Gesellschaft für Technische Zusammenarbeit. (Indonesian version also available). Ulbricht, R., Hinrichs A. & Ruslim, Y. 1999: Technical guideline for salvage felling in rehabilitation areas after forest fire. SFMP Document No 1. Jakarta: Ministry of Forestry and Estate Crops in cooperation with Deutsche Gesellschaft für Technische Zusammenarbeit. (Indonesian version also available).